Gentoo penguins are marine birds found across the Antarctic Islands. Their style of walking, called waddling, is rather fun to watch as it involves the tail feathers swaying from side to side as they walk. They can dive up to a depth of 650 feet and stay underwater for long durations of time. Size (Height) – They usually reach a height of around 30 inches (76.2 cm). Weight – The maximum weight for males is 19 lbs (8.5 kg) while the minimum is 11 lbs (4.9 kg), and the maximum weight females reach is 18 lbs (8.2 kg) with the minimum being 9.9 lbs (4.5 kg). 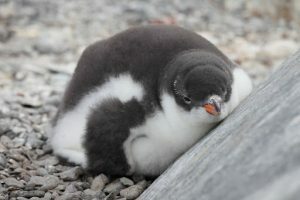 Color – The back is black and the dorsal side white, there are white eye-patches that are joined with a narrow band of white across the forehead. The bills are reddish-orange. 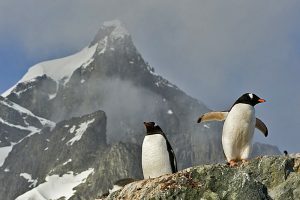 Both subspecies are spread across the Falkland Islands, Kerguelen Islands, South Georgia, South Shetland Islands, Macquarie Islands, Heard Islands and in the Antarctic Peninsula. 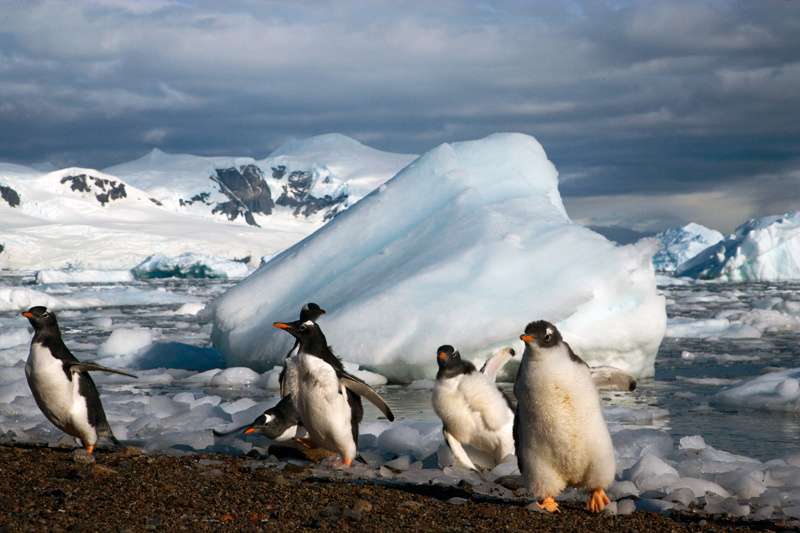 Gentoo penguins live in frozen and rocky Antarctic islands looking for food near the shoreline. Breeding penguins prefer flat grounds with small rocks and pebbles with which to construct their nests in vegetation. They may choose an area close to the ocean or far inland. 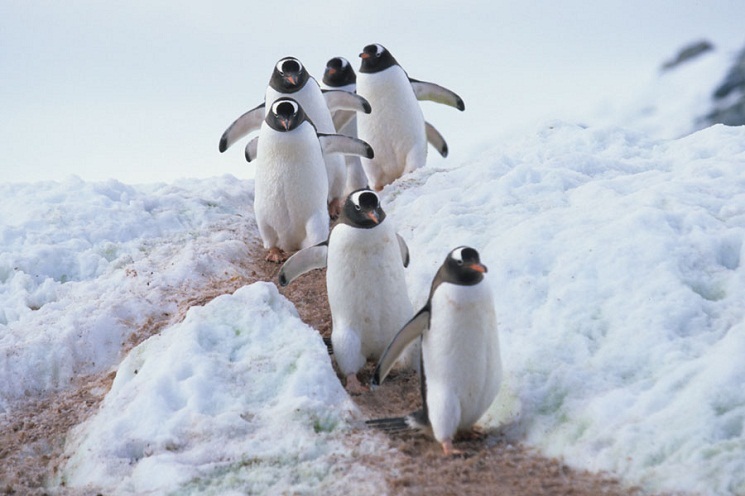 They are very loyal to their nesting sites and spend most of their lives in and around it. They do, however, have to leave when the ice renders the area unlivable. They also traverse away from these sites during their molting season. They are loyal to their breeding partners too, with their partnerships usually lasting for many years. Their rate of separation is only 20%. 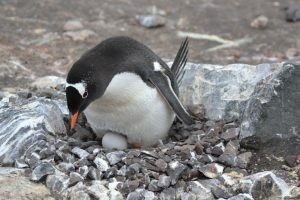 Gentoo penguins are very protective of the rocks they build their nests with, and can resort to noisy quarrels in ownership disputes. 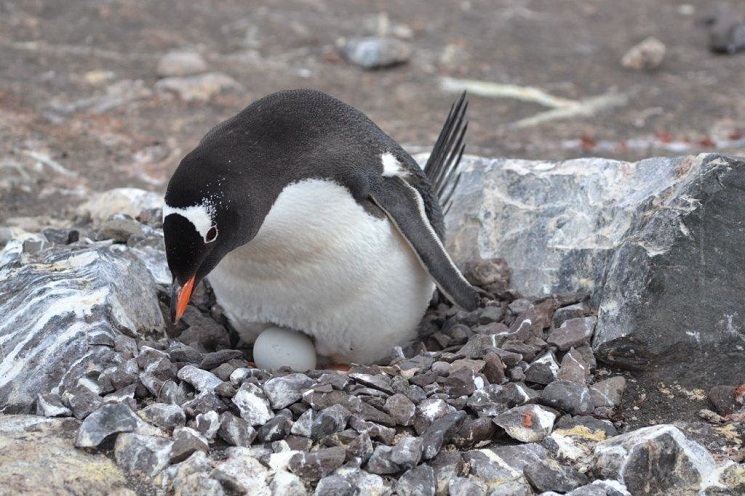 The wooing process for the gentoo penguins involves the male choosing a nest site and bellowing out calls, inviting females to come and check the site. If considered appropriate by a female, they engage in mutual bowing or trumpeting. The breeding season occurs once yearly. The female lays two spherical white eggs, which both parents incubate for around 30-40 days. Chicks fledge after around 75 days until which time they stay in the nests with the parents looking after them. Eventually reaching independence after about 100 days, they reach sexual maturity when they are around 2 years of age, though only start breeding when they are 3-4. 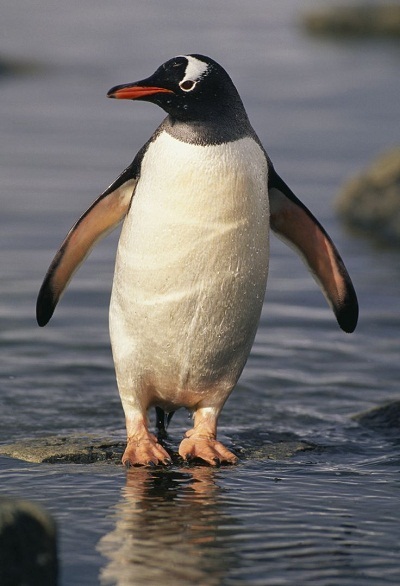 The average gentoo penguin lives for around 13 years in the wild. 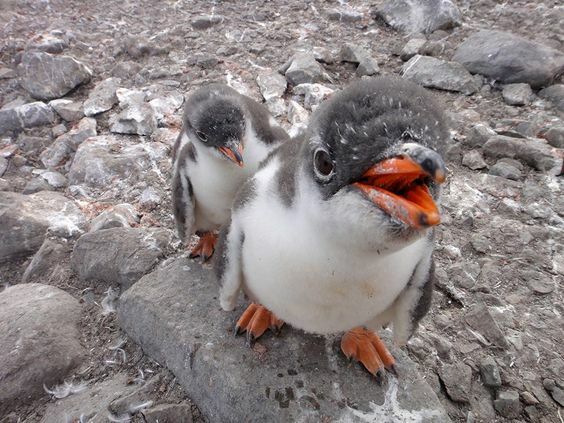 They communicate with each other through a variety of high-pitched squawks, low-pitched hisses, tactile and visual forms. 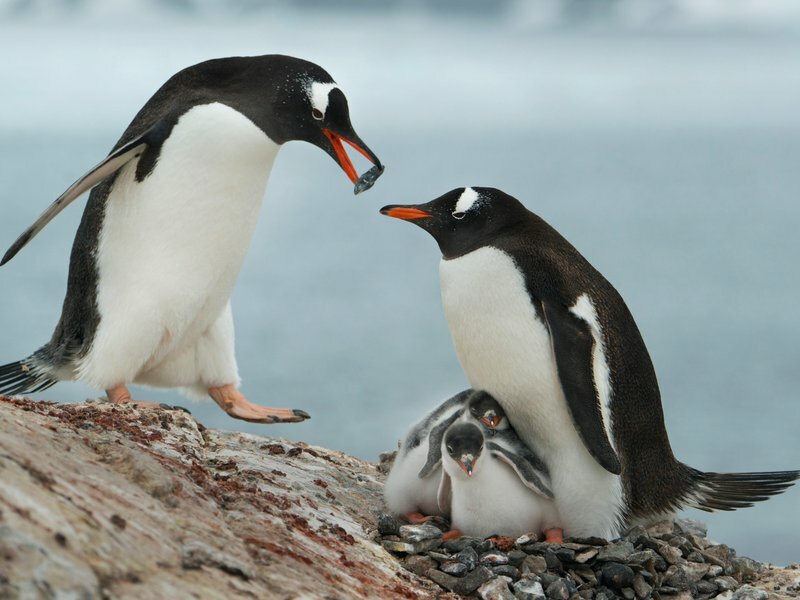 Hungry babies produce a high-pitched chirp to let the parents that they need food. 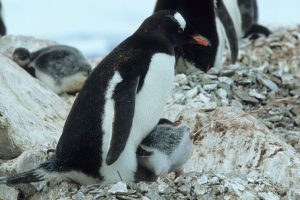 Juveniles achieve the adult sounds after their first molt. 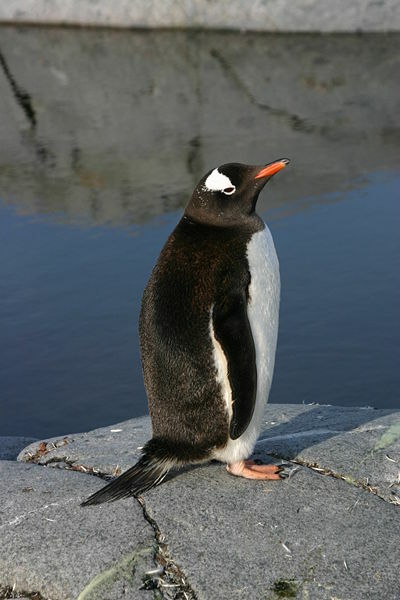 Gentoo penguins primarily eat crustaceans, fish, and squids, with krill forming the majority of their diet. Their coloration helps them become invisible when they are underwater as from above they blend in with the sea floor, whereas from below they blend in with the sky. Gentoo penguins’ frozen habitats do not make freshwater easily available to them and they also eat organisms that are high in salinity. Thus to ensure that they do not overdose on sodium, they have glands located just above their eyes from where the excess sodium drips out of their body via the tip of their beaks. They make their feathers waterproof by using the beaks and applying all over their body an oily substance secreted from the base of the tail. Molting also helps them in achieving this. 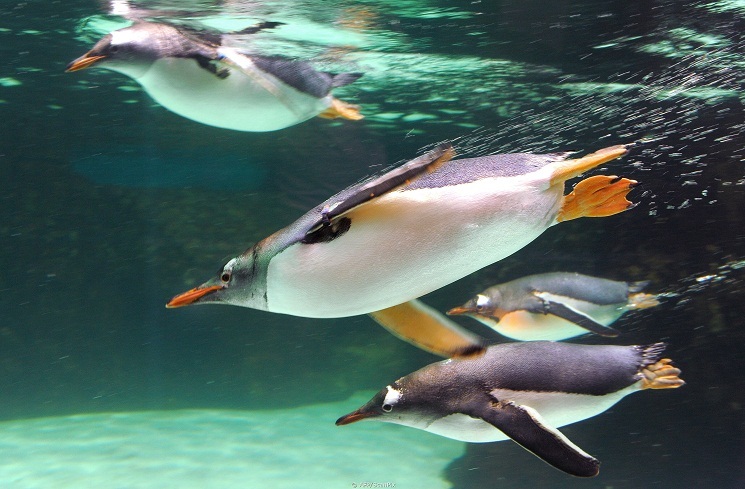 The flaps and highly developed webbed feet make them adept at swimming; they are the fastest swimmer among all penguins, in fact, reaching nearly 30 mph underwater. Killer whales, leopard seals, and sea lions prey on gentoo penguins in the water. There aren’t any documented terrestrial predator of this bird because of the harsh habitat they live in. 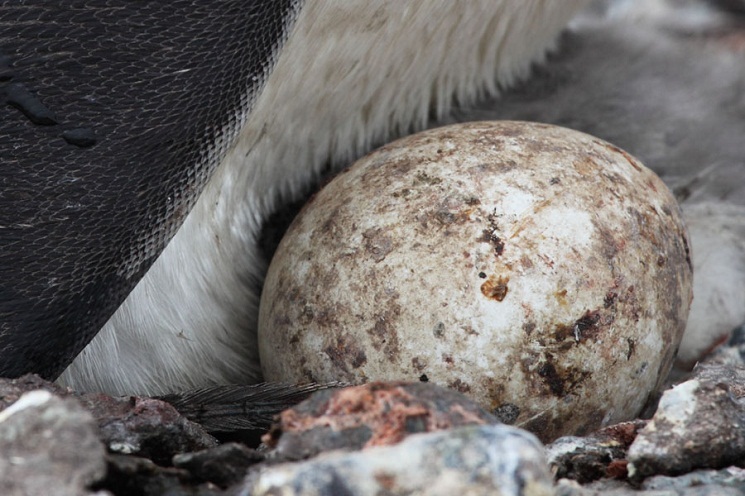 Skuas, however, do prey on the eggs and young juveniles. 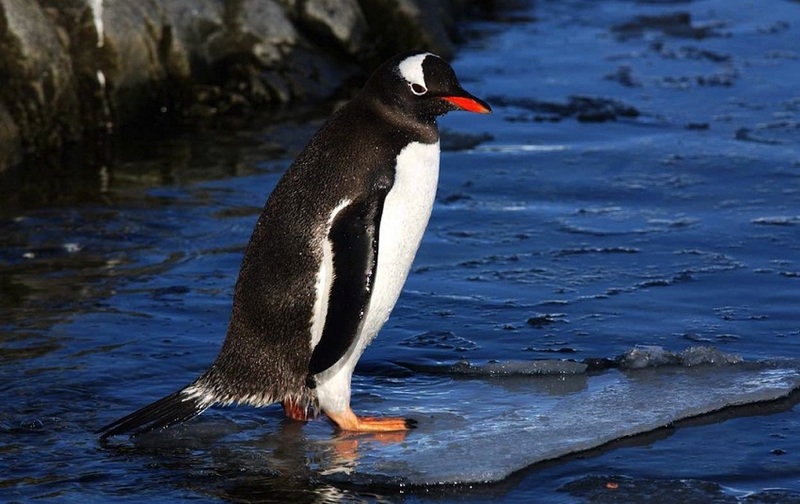 The IUCN lists the gentoo penguin under their ‘Least Concern’ category. Gentoo penguins are the third largest of all penguins, behind the emperor and the king penguin. The source of their name is unclear. 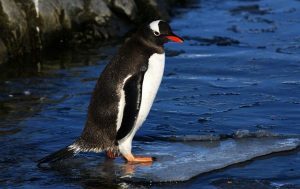 It is commonly believed to be borrowed from Portuguese, wherein it means gentile, and the English changed it to gentoo to refer to Hindus in British India.